Finnish National Opera has had a French opera, Thaïs, in their schedule this winter. 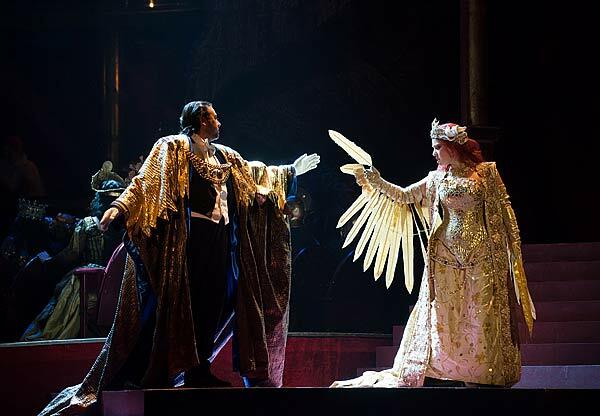 Jules Massenet’s opera tells the story of the dual of faith and desire. Monk Athanaël swears to convert famous courtesan Thaïs and promises her promises eternal life if she leaves the life of courtesan and moves to the abbey. Athanaël’s belief convinces Thaïs and she follows him to abbey through a bare and vast desert. However during their journey together Athanaël falls in love with the lady and in the end, the two central characters have swapped their roles: the sinful woman has become holy lady and the holy man a sinner. The opera engrosses the audience immediately from the mysterious opening scene where the doors of a tenement house open one by one, letting the light come through while the silhouettes of the monks step onto the stage. The scenes are simple but powerful. 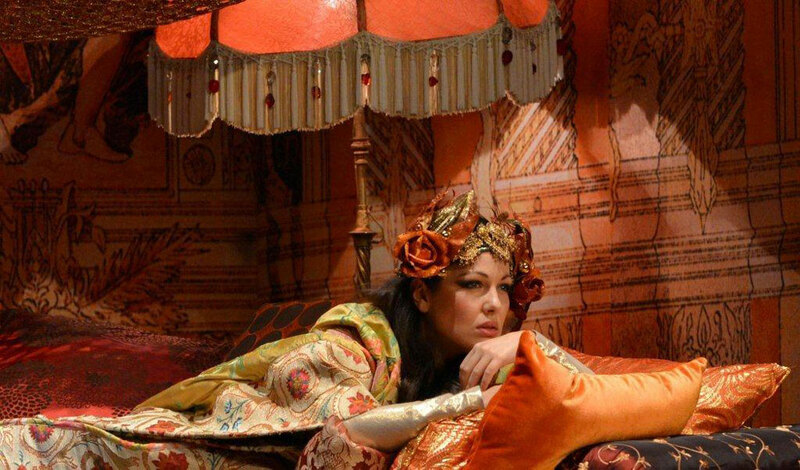 The famous violin solo ‘Meditation’ in the beginning of the second act fills the theatre when the courtesan begins to consider her life and is filled with regret. The opera retains its power all the way to the tragic ending where Thaïs, dresses all in white, sings of heavenly light while Athanaël’s tries to confess his love to her. Sets and costumes mix different time periods together creating a peculiar setting for the story. Athanaël is dressed in rags and sandals, whereas the other monks wear red silk or tails and top hats. At the same time the wealthy men who fancy Thaïs wear heavy capes and the fallen women appear in oriental dresses coated with jewellery. All the costumes are fascinating with interesting details, but the most impressive costume must be the dress which Thaïs wears in her first scene. Attached to her arms she has golden wings which bring out her diva attitude as she makes dramatic moves with her arms. The only crack in the picture is the actress who plays Thaïs. The queen of promiscuity, who ties every man around her little finger, looks more like a middle-aged aunt in corsets and feathers than a bewitching goddess. However, the harsh first impression is swiped away when she begins to sing. All the actors perform their parts passionately and the orchestra plays beautifully. It doesn’t matter if the audience doesn’t understand French: the subtitles on the screen give the main information. The music itself tells the story. The orchestra creates the atmosphere and the actors sing out the emotions so that it is impossible not to understand when they are sad, excited, passionate or regretful. Decorative sets and colourful costumes delight the eye and the music fills the mind. This is a holistic experience for senses and emotions. Opera at its best.